Our technology enables high efficiency small size VCSELs to reach the densest arrays possible. The active materials are fully embedded in semiconductor using a non-oxide process. This results in an excellent thermal performance. 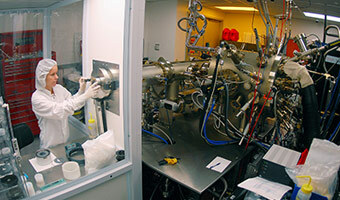 Epitaxial Crystal Growth – SD Photonics has advanced epitaxial growth processes for new types of lasers and detectors. Our state of the art growth techniques offer customers advanced prototypes adaptive to a variety of applications. Photonic Device Development – SD Photonics develops advanced laser and detector technologies. Lasers – SD Photonics has record performing lasers using proprietary growth processes and designs that can offer customers higher performance than is possible with other commercial technologies. Our proprietary technology uses a high heat flow cavity (“HHFC”) (TM pending) shown to reduce junction temperature and increase maximum power. Our miniature lasers offer improved single mode performance and higher efficiency over other approaches. Our lasers are also being developed for military applications for use in extreme environments. SD Photonics offers to the customer intellectual property for new for laser device structures in vertical cavity surface emitting lasers (VCSELs). These VCSELs are based on the demonstrated to lower junction temperature under the operating conditions important for most applications.